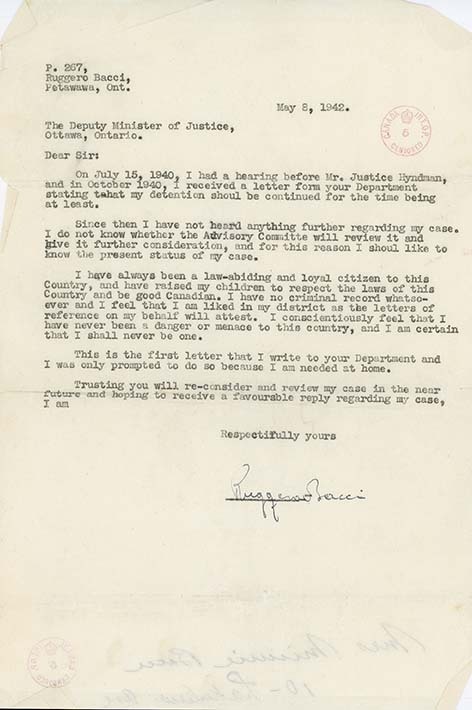 Letter from Ruggero Bacci, to the Deputy Minister of Justice, May 8, 1942. In the letter Bacci refers to a review of his case by the Advisory Committee and Justice J.D. Hyndman in Fall 1940. The result was his continued detention for another 19 months, and no additional explanation about his case. Bacci asks whether an additional review will take place, noting he has always been a law-abiding resident of Canada. Under the the DOCR (Defence of Canada Regulations), after 30 days, internees could formally object to their detention to an advisory committee appointed by the Minister of Justice. The Minister of Justice then appointed a judge to review the internee’s case. This meant an examination of the RCMP’s evidence against the internee, meetings with the internee, and interviews with witnesses who could attest to the internee’s character. After this, the judge either recommended an internee’s release or continued internment to the Minister of Justice. On July 15, 1940, I had a hearing before Mr. Justice Hyndman, / and in October 1940, I received a letter form your Department / stating that my detention shoul be continued for the time being / at least.